SPUDSTITUTION: This recipe replaces traditional whipping cream with potatoes! 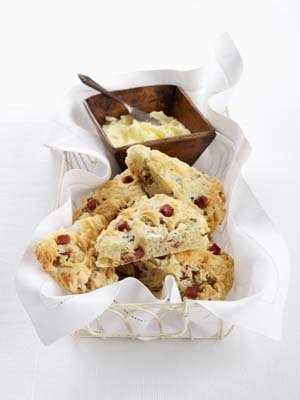 These elegant scones are a perfect complement to lunch or dinner or just to snack on throughout the day. In large bowl, combine flour, baking powder and salt. Using pastry cutter or fingers, cut butter into flour until coarse crumbs form. Using fork, stir in mashed potato. Drizzle eggs over top and combine until just blended. Add ham, 1/3 cup (75 mL) of the cheese, basil, pine nuts and garlic. Scrape dough onto well floured surface and knead gently to bring dough together. Pat dough into 3/4-inch (2-cm) thick round. Cut into 8 wedges, separate and brush each with oil. Sprinkle remaining cheese over top. 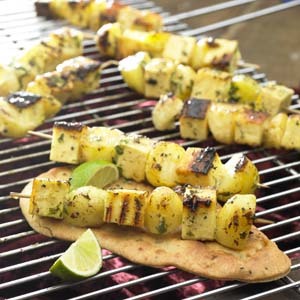 Place wedges on parchment paper-lined baking sheet and bake in 400 F (200 C) oven about 20 minutes or until golden. Create individual mashed potato mounds ready for the dinner plate or to serve at a holiday buffet table. This recipe can be made ahead and re-heated when needed. In large skillet melt butter over medium high heat and add onions, garlic and thyme. Cook, stirring for 5 minutes or until onions are beginning to turn golden brown. Reduce heat to medium and cook, stirring often for about 15 minutes or until very soft and deep brown. In large pot of boiling salted water, cook potatoes for about 20 minutes or until fork tender. Drain well and return to pot. Add stock, salt and pepper and mash potatoes until smooth. Stir in caramelized onion mixture until combined. Using 1/2 cup (125 mL) measure, scoop out mashed potatoes into large mounds onto greased or parchment paper lined baking sheet. Using back of small spoon make an indentation in centre of potato mounds and divide goat cheese among potato mounds. Place in 400 F (200 C) oven for about 15 minutes or until cheese is melted. To make the potatoes ahead, fill with cheese, cover with plastic wrap and refrigerate for up to 1 day. Reheat in oven for about 30 minutes or until warmed through. Crisp golden potatoes absorb the sweet flavour of white balsamic vinegar in this slightly Mediterranean version of a summer favourite. For a fun Canada Day treat, use a maple leaf cutter and cut out leaves from the red peppers to celebrate our country. Place potato wedges and pepper on greased grill over medium high heat and grill for about 20 minutes, turning once or until golden and tender. 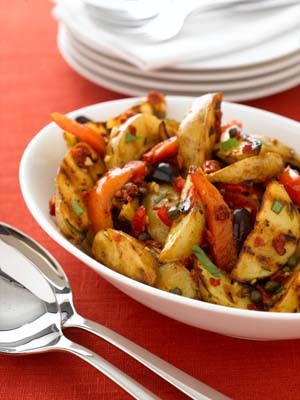 Thinly slice red peppers and return to bowl with potato wedges. White Balsamic Dressing: Meanwhile, whisk together oil, vinegar, tomatoes and garlic. Pour over grilled potatoes and peppers. Add olives, basil and capers and toss gently to combine. Serve warm or cover and refrigerate for up to 2 days. Bring to room temperature and toss well before serving. Tip: You can substitute 1 jar (340 mL) roasted red peppers, drained and sliced for the 2 red peppers. 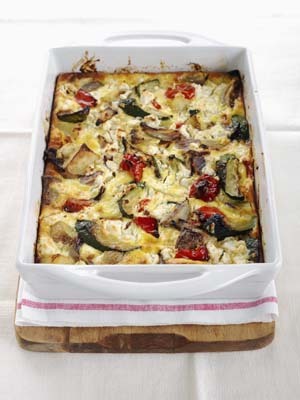 This bake offers up colour, flavour and ease appeal by "roasting” the vegetables in a skillet. This not only is great out of the oven but also perfect served up at room temperature. In large skillet, heat oil over medium heat. Cook shallots and garlic 3 minutes or until softened. Add potatoes and stir to coat. Cover and cook, stirring occasionally, about 15 minutes or until tender. Increase heat to medium high and add zucchini, red pepper and thyme and cook about 4 minutes or until golden. Remove from heat and add vinegar and half each of the salt and pepper. Let cool slightly. Spread vegetables in shallow 6-cup (1.5-L) greased casserole dish. Crumble goat cheese over vegetables. In bowl, whisk together, eggs, cream and remaining salt and pepper. Pour over vegetable mixture and bake in 350 F (180 C) oven about 45 minutes or until knife inserted in centre comes out clean. 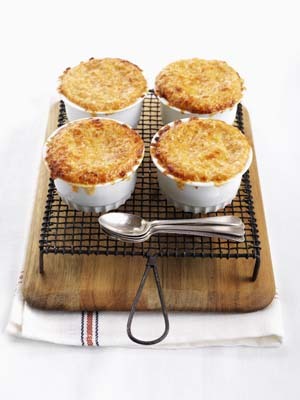 Individual Option: Use eight 1-cup (250-mL) ramekins/small casserole dishes and reduce baking time to about 30 minutes. 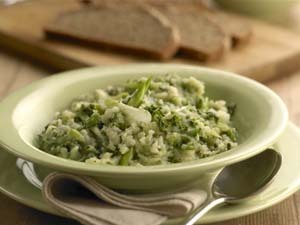 This creamy side dish is usually served with a creamy milk and extra dollop of butter on top at the table. Our version has less butter, and uses low fat milk to still produce a rich flavourful dish with all the great taste. A traditional colcannon has cabbage in it, which is just as delicious, but adding kale increases your folate and vitamin K count and gives it a rich deep green colour-perfect for St. Patrick’s Day! In large pot add potatoes and parsnips and cover with cold water. Bring to boil and cook for about 20 minutes or until very tender. Drain and return to pot. Meanwhile, in large deep skillet, bring 2 cups (500 mL) water and kale to boil. Cover and cook for 10 minutes or until tender. Drain in colander. Return skillet to medium heat and melt butter. Add onions and cook for about 5x minutes or until softened. Add kale and milk and bring to boil. Mash potatoes and stir in kale mixture. Add salt and pepper and stir to combine. Tip: By stirring in the kale and milk mixture you create a light, fluffy potato mixture that is so creamy, you will want seconds. Brûlée for dessert…why not for dinner? Freshly grated Parmesan cheese helps these creamy potatoes show off a golden colour. The hint of horseradish will keep you coming back for more. Cut tops off garlic and place in piece of foil. Drizzle with oil. Seal foil to form packet. Place garlic in 400 F (200 C) oven 45 minutes or until garlic is soft when squeezed. Let cool. Meanwhile, in large pot of boiling salted water, cook potatoes 20 minutes or until fork tender. Drain well and return to pot. Squeeze in roasted garlic. Using potato masher, mash potatoes until coarse. Add cream, butter, horseradish, salt and pepper; continue mashing until smooth. Divide potato mixture among 8 ramekins. Sprinkle with cheese and place on baking sheet and brûlée under broiler 5 minutes or until golden on top. 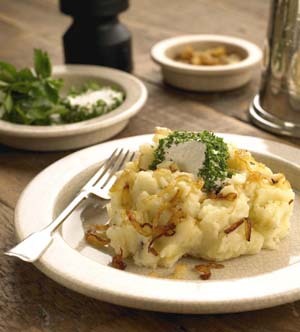 Yogurt-Mashed Potatoes: Omit light cream and butter and use 2/3 cup (150 mL) low-fat plain yogurt. Chicken/Vegetable-Mashed Potatoes: Omit light cream and butter and use 1/2 cup (125 mL) chicken or vegetable stock. Tip: For ease of filling ramekins, simply scoop mashed potatoes into piping bag and fill ramekins or alternatively pipe decoratively on baking sheet before adding cheese and broiling. Stuffed with delicious Gruyere cheese, mushrooms and a medley of herbs and spices these soufflés are easy enough to create for a weekday dinner and delicious enough to serve at your next gathering. Prick potatoes with fork a few times and place in 400 F (200 C) oven and bake for about 1 hour or until tender when pierced with knife. Let cool slightly. Meanwhile, in skillet melt butter over medium heat and cook onion, garlic, mushrooms, parsley, thyme and half each of the salt and pepper for about 8 minutes or until softened and golden brown. Set aside. Cut top third of potatoes horizontally off and scoop out flesh from top piece and entire potato into bowl, leaving 1/2-inch (1 cm) thick shell. Mash potato flesh with remaining salt and pepper and add onion, mushroom mixture and Gruyere cheese; stir to combine. In bowl, beat egg whites until stiff peaks form. Fold one third of the egg whites into potato mixture to lighten. Fold in remaining egg whites until evenly combined. Mound mixture into potato shells and place in small baking dish and bake in 350 F (160 C) oven for about 20 minutes or until lightly golden. Broil for about 3 minutes or until golden brown and slightly crisp on top. Try using other favourite vegetables and cheese combinations like cooked broccoli and cheddar cheese or roasted red pepper and Asiago cheese. Using a meat mallet to crack or smash the potatoes helps to break the skin enough for the flavour to get to the meat of the potato. Cooking the potatoes on the stove helps give a golden colour and added crunch appeal to the potatoes. In large shallow Dutch oven, add oil and heat over medium low heat. 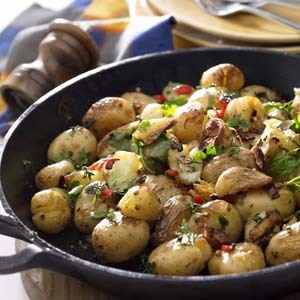 Add potatoes, parsley, chili pepper, coriander seeds and thyme. 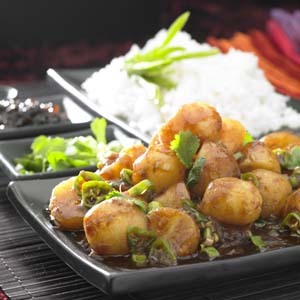 Cover and cook, stirring frequently, for about 30 minutes or until potatoes are tender and golden. Add fresh coriander and salt and stir to combine before serving. 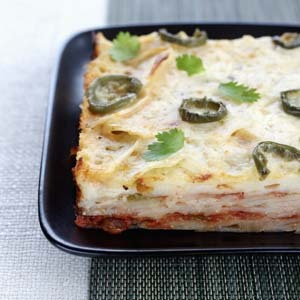 This creamy dinner favourite is spiked with spicy Mexican flavours of salsa and jalapeno. 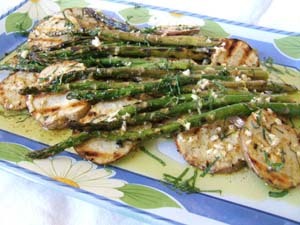 If you want to decrease the heat slightly omit the pickled jalapenos and you will still end up with a tasty side dish. In saucepan melt butter over medium heat and add flour and cook, stirring for 1 minute. Whisk in milk and cook, whisking constantly for 3 to 5 minutes or until beginning to boil and thicken. Remove from heat and whisk in cheese, salt, oregano, cumin and pepper until smooth; set aside. Peel and thinly slice potatoes. Arrange one third of the slices into greased 8-inch (2 L) square baking dish. Spread with half of the salsa. Repeat layers once and layer remaining potato slices on top. Pour cheese sauce over top and around sides to cover evenly and reach bottom of dish. Sprinkle with pickled jalapeno peppers, if using. Cover with foil or lid and bake in 375 F (190 C) for 1 hour. 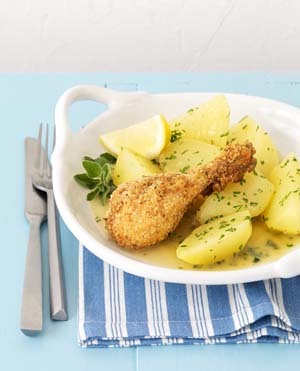 Uncover and bake for 30 minutes or until lightly browned and potatoes are tender. Let stand 5 minutes before serving. 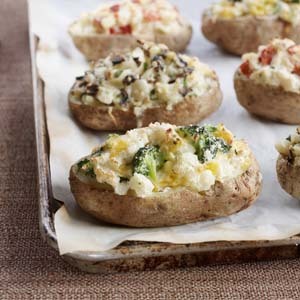 An easy side dish or snack with big flavour in every bite of baking potato, yet low in fat. Mix together cheese, chili powder and salt. Set aside. Use large sharp knife to cut potatoes in half along lengths of potatoes. For younger kids, a parent should do the cutting. Lightly brush cut sides with olive oil, right over edges. Holding each potato half over a bowl, use a spoon to sprinkle cheese mixture over oil-brushed surfaces, sprinkling over edges to completely dust entire oiled surface. 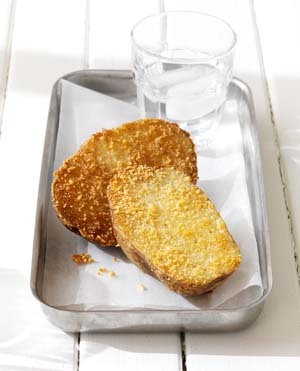 Place potato halves, cheese side down on parchment-lined baking sheet. Repeat for all six halves. Lightly brush skins with olive oil. Bake 25 minutes, until potato halves can be pierced with a paring knife.